Bought my 07 Screw in February and have about 2,000 miles on it. Came from a 04 Tacoma double cab. I love the size of this truck, the fact it’s a 4x4, the leather seats, the fold away mirrors and the way it handles. My complaints are the lack of usable storage in the cab, the auto ac, and it is underpowered for its size. Just got back from my dealer. Ordered an 07 4x4 SCREW Lariat with 6.5' box. My 98 was getting long in the tooth. Now for the waiting while it gets built. I picked up a black '07 Scab Fx4 on Monday. Already put 200 miles on it. Its replacing my 06 XLT, that was wrecked two weeks ago. I think my '07 has a much better build quality than my '06, the body and interior panel fit is better. The '06 had a few minor but annoying rattles and noises from day one. This is my 5th Ford vehicle. My list is 1993 Mustang GT, 1988 F-150, 2002 Mustang GT, and my crashed 2006 XLT. I'm on my second one. I had an '04 Lariat 4x4 that I had to sell when we moved (long story). I had an '05 Acura RL for a couple of years, but the itch was coming back, so I traded it on my new F-150 SuperCrew Lariat 4x4 a few weeks ago. The rebate wiped out any resistance I had. It's pretty loaded (nav, rear seat entertainment, 3.73 LSD, 20" wheels etc) and I doubt that I'll do much in the way of mods. I did put on a Retrax tonneau last weekend, but that may be it unless I do Line-X again. Here is mine. just picked it up a couple weeks ago. I love it so far! Nice reviews here. Back in 97 I went after my first truck. Had my sites on a Z-71. Drove everything on the market, but it came down to the Z-71 and F-150. GM owners told me about various quality problems in their trucks. In driving, Fords were noticeably tighter built, firmer and better handling. The GM’s felt sloppy. The Ford SCab 3rd door and fold-down rear seat designs were much better. I discovered how to negotiate a lease (not through lot salesmen), and made a great deal for a silver 98 2WD XLT SCab through a Ford fleet sales department over the phone. No lessor could come close to the deal for a Z-71 due to much lower residual values. I absolutely love this truck! It’s the same color and basic config as my ‘04. I added reverse sensing to this one, since the deep bed/high tailgate make it so difficult to see when backing up. The feature works well. I also added the step bars after watching too many ladies struggle to climb into my last truck. I went with the longer bed so I'd have room for a tool box, and upgraded to the 6-disc CD changer, which is very nice on road trips. My least favorite of the F-150's was my 01 Lariat. I like leather, but the quality wasn't great and it scuffed easily. Ford's cloth looks good and is functionally better. I also didn't like the Lariat's electronic climate control that much, and just prefer the ***** on the standard unit. Since the '01 I've gone back to loaded up XLT's. I can get just about every feature I want, and avoid the ones I don't want including now the more expensive 5.4L motor. I like the FX4's except for two things: the mandatory black interior, and the flow-through console. The center shifter is cool, but the XLT console is MUCH larger inside and way more practical. I find great function in the features I order. The auto-dimming and heaters in the deluxe mirrors are awesome. I wish you could also get power-fold on the XLT. The captain's chairs and power driver's seat are must-have. The fogs light up wide, good for seeing deer standing off in the ditches, foggy or not. The headlights are great, but I don't like the sharp vertical cut-off angle. This is important to other drivers on the highway, but when traveling hilly back roads, you can't see what's up the next hill when you're on the way down the one before. I need a set of driving lights, but have been offended by the cost. One thing I don't really like is the lack of functionality in the SCrew’s rear seat folding and storage arrangement. The 98 SCab was OK. Nothing since has been as good. Ford needs to provide storage behind the seat. I like the function of Vent Shades, but found they made a lot of wind noise on a previous truck, so left them off this one. I'd like to put Line-X in the bed, but not on a lease. Ford doesn't penalize on turn-in with a scratched up, dented bed - after all, it's a truck. Other than 15.3 MPG highway at this point, I'm very happy with my F-150. The 4WD, larger gears and tires, and my driving habits are probably to blame for the mileage. I've driven other people's Chevy's and Toyota's lately, and am still glad I've got a Ford. These are very capable, comfortable, and well built trucks. Ordered on 03/12/07, Delivered on 04/17/07. I absolutely love the truck. I traded in my 99 Supercab 4x2 as I was needing more room in the backseat. With the extended powertrain warranty, great deal I got on it, and free money for 60 months, now was the time to do it. No dislikes so far. 1) She isn't a diesel (usually what I drive). 2) She is black (a beauty when clean, a [email protected]#$ to keep clean). 3) I put a full topper on her (that looks very UNsporty). 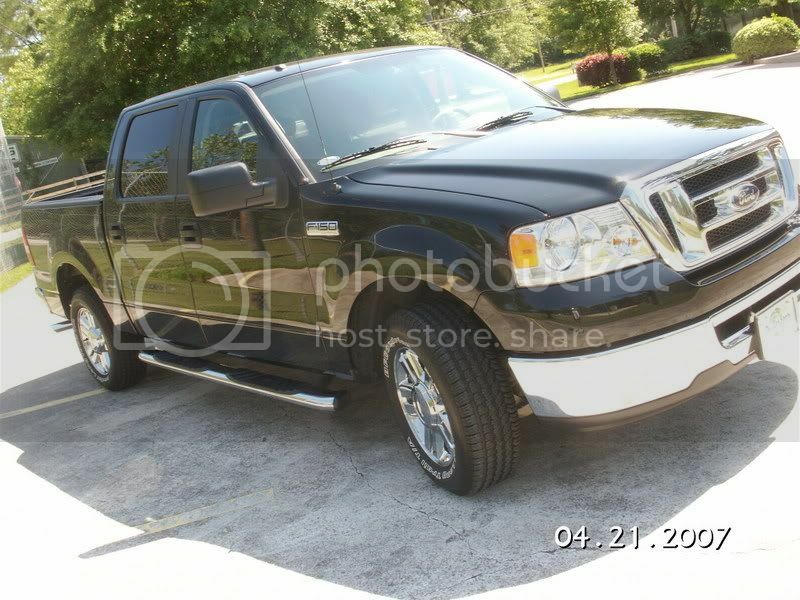 4) It's not a King Ranch (maybe next time). Other than that, NOTHING. She is a great rig for a daily driver. Ask me at the middle of summer when I've logged a few camper hauling miles... I hope she pulls it! Had 2005 and went to 2007 6.5. Well, I've always driven manual transmission, manual windows, types of trucks, so needless to say, I feel like I'm cruising in luxury in my 07. It's not a screw, but the scab, but that's all I needed. power windows, power mirrors, sunroof, power from the 5.4, love the automatic transmission, and my overall favorite is the flow-through center console. That console really makes the overall interior feel like you're just cruising in style. 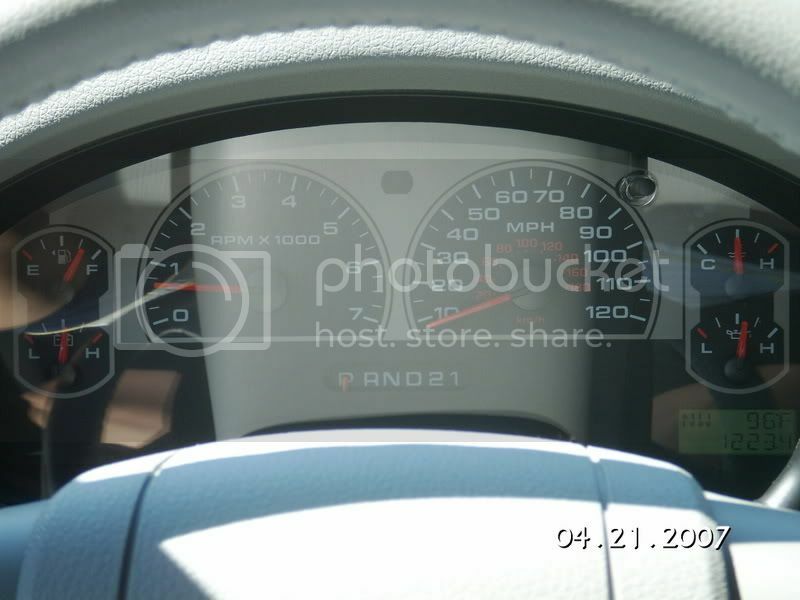 The fx4 dashboard also seems nice...I drove an XLT and the FX4 just seems so much more sporty with the layout and the chrome surrounds on each gauge. I also love the interior size of this thing...don't know if I could ever go back. The bed is huge -- I love how deep it is. Oh yeah, power driver seat is also a HUGE plus. I wish I would have known about the whole computer system thing that tells you how many miles to E and average fuel economy...and the power folding mirrors would have been a nice option as well. Other than that, not much I dislike and I'm not even sure those really count as dislikes, just things I wish I got. I do dislike the fact that my paint chipped off while waxing it heh. Got my 07 screw on dec 30, 06. Love the truck. I have an edge and a magnaflow duel system on it. Sounds great... goes great. Now when I get my 2.5 leveling kit and add a leaf on.. 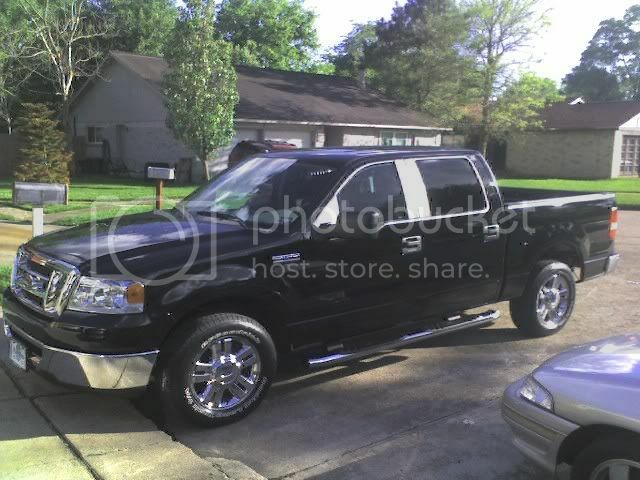 I will be about done with mods and have the truck I like. 7,000 miles here and loving every minute of it. Picked my truck up on March 12 and overall very pleased. No problem towing and rides better than my Jeep Gr Cherokee Ltd. Just hit 2K miles. Somewhat concerned about ticking sound when idling and may make a visit to the dealership for diagnosis. In reading other posts, not sure if this is normal or not! got my s crew xlt a month ago. like all but the feel at idle. I noticed Taiichii mentioned the same problem. Anyone else notice this. Mine is also 4.6 . Hey jrtexas50 I also noticed this ticking but it does not do it all the time . The idle though seems rough to me. the dealer will most likely tell you characteristic of the motor. That's what they told me. (I don't buy it though) What part of TX you from. I'm near Tyler. Picked Up a 2007 XLT 4x4 Screw 4.6 6.5 ft bed about 2 weeks ago. Dealer asked what color we wanted? I said any color but red. We ended up with a Redfire and Silver with Flint cloth interior. Dealer only had that one and a Stone and Gold with a Tan interior, optioned the way I was willing to pay for. The rest were "Tomato" Red. My wife talked me into the Redfire because of the Grey interior. Dealer through in the sprayed in bedliner. They added the chrome step bars and "Undercover" Hard Cover at half price. We added Bug Deflector and Trailer Hitch. It has less then 800 miles on it right now. My wife totaled my 98 Explorer about 3 weeks ago. We only had one payment left to make. I thought we would never own a new vehicle but we were able to get this for a few thousand more then the used ones we were looking at. Last edited by AZ Traveler; 05-10-2007 at 10:15 AM.